The following precautions are necessary to avoid potential harm to the user or damage to the device. Do not use a damaged charger with a USB cable, or loose sockets. Avoid ‘cable kink’ and other damage to the USB cable while charging the battery. While charging, the USB cable and battery block should not be touched with damp hands. Do not use the device during thunderstorms, which increase the risk of electrical shock. Do not place the device inside or on top of heating sources (such as microwaves, stovetops or radiators). When severely overheated the device may explode. Do not expose the internal components of the device to moisture. Do not attempt modification or repair of the device. In case of malfunction, contact the manufacturer. Extreme heat and cold may damage the device, as well as reduce battery life and power output. Product subject to WEEE regulations concerning separate waste collection. The device should only be used on healthy, undamaged skin. The battery projection should interlock precisely with the cut-out section of the battery mount. Important! Proper installation of the battery should result in illumination of the LED, located in the electrical block (LED will be lit for 2 seconds). The device’s readiness for use is indicated by the periodic illumination of the LED in the electrical block, which blinks once every 2 seconds. The battery projection should interlock precisely with the cut-out section in the charger’s rotating handle. Fully recharging the battery should take no longer than 4 hours. LED flashes red: battery is charging. 4.4. Apply foam pads (x4) to the electrodes if necessary. 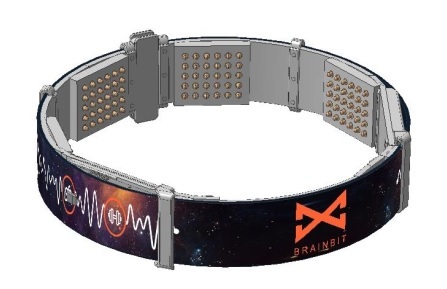 Brainbit is now ready for use. All parts of the device may be carefully wiped clean with a moist toilette. The textile band should be periodically washed with soap and warm water. Do not expose the internal components of the device to moisture! Warrantied period of operation - 12 months. Warrantied period of storage - 6 months from date of production. In the event that repair or correction of defects is necessary during the warrantied period, the warranty is extended by the amount of time for which the device is not available for use due to the defect or malfunction. If the device is replaced in its entirety, the warranty period is renewed from the date of the replacement. Warranty repair of the device is carried out at the cost of the seller/manufacturer. After expiration of the warranty, the cost of repairs is borne by the purchaser of the device. If a warrantied device ceases to function due to improper operation, then the cost of repairs is borne by the purchaser. 1. The battery may be fully drained. Remove battery from device and charge it in accordance with ‘Charging the Battery’ (page 14). Then install the battery and confirm that the device enters Standby Mode (indicated by the LED blinking once every 2 seconds). 2. The battery may be missing. Install the battery. 1. Confirm that the battery is installed in its housing. 2. Check that the battery has been inserted properly. This page was last modified on 30 May 2018, at 11:05.